At Green Elite Clean attention to detail is key and pillows are often a very over looked detail. Did you know our pillows double in weight after about two years from absorbing dust, mold, bacteria, and dead skin? Don’t fret we are here with a few helpful hints on how to keep them fresh and clean. A pillow should be washed about three times a year and replaced about every two years. To wash a pillow be sure to check what your pillow is made out of. 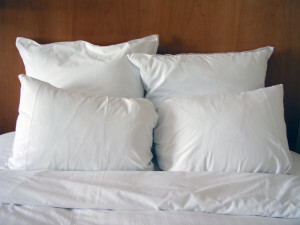 You can wash polyester pillows and feather-filled pillows the same way. For foam or silk pillows follow the product care instructions. You want to choose a gentle, un-scented detergent because you will be laying your head down on it and you don’t want any harsh chemicals or scents on your face. The next step before you load your pillow into the washer is to press as much air out of your pillow as possible. If you have a top load washer you will want to fit two pillows in order to keep your washer balanced. If you have a front load washer you can fit 1-2 pillows. After loading your washer you will want to set it to use warm washer and go for a full cycle. After the full cycle is done you are going to run the washer again on the spin cycle. They key is to get as much water out of your pillow as possible, it will reduce mildew growth. Before you dry your pillows you will need two tennis balls and two white socks. Put the tennis balls in the socks and tie them so the ball cannot fall out. The tennis balls will help beat out any moisture that is left in your pillows and the socks ensure that the color or smell of the tennis ball does not end up on your pillow. Run your pillows for a full drying cycle on low heat. You want to be very gentle with your pillows. When it is done drying take a deep breath into the pillow to see if there is any moisture left. If there is moisture left over run it in the dryer again, if not, your pillows are ready to go back on the bed for another few months!